The igGrid control feature column fixing in the grid. The column fixing feature allows you to pin the columns on the left or the right of the grid so that they are always visible. The following code snippet demonstrates how to initialize the igGrid control with column fixing feature. A list of column settings that specifies custom column fixing options on a per column basis. Specifies whether the column allows to be fixed or not. Specifies column index. Either key or index must be set in every column setting. Specifies column key. Either key or index must be set in every column setting. Specifies whether the column to be fixed or not. Feature chooser text of the fixed column. Feature chooser text of the unfixed column. configure on which side to render fixed area. fixed column are rendered on the left side of the main grid. fixed column are rendered on the right side of the main grid. Specify initial fixing of non data columns(like specific rowSelectors columns on the left side of the grid) when fixingDirection is left. Specifies altering text on column fixing header icon when column is not fixed. headerFixButtonText: "Click to fix this column"
Specifies altering text on column fixing header icon when column is fixed. headerUnfixButtonText: "Click to unfix this column"
minimal visible area for unfixed columns. For instance if you fix a column(or columns) and the width of the fixed columns is such that the width of visible are of unfixed columns is less than this option then fixing will be canceled. The width can be set in pixels (px) and percentage (%). Option to configure scroll delta when scrolling with mouse wheel or keyboard in fixed columns area. Option to show column fixing buttons in header cells. Option enable syncing heights of rows between fixed/unfixed rows. use args.owner to get a reference to the widget. 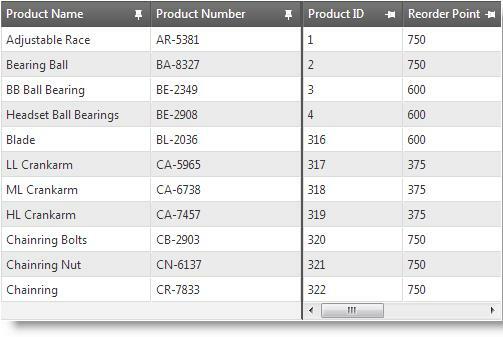 Fix column by specified column identifier - column index or column key. An identifier of the column to be fixed - column index or column key. when true indicates that the column is multi-column header. Fix data skipped columns(like row selectors) if any when fixing direction is left. If already fixed nothing is done. Unfix column by specified column identifier - column key or column index. An identifier of the column to be unfixed - column index or column key. Unfix data skipped columns(like row selectors) if any when fixingDirection is left. Classes applied in feature chooser icon when column is not fixed. Classes applied in feature chooser icon when column is fixed. Classes applied to the main fixed container. Classes applied to header cell button for fixing column. Classes applied to the container div of header button(which holds button for fixing/unfixing). Classes applied to header cell button for unfixing column. Classes applied to the left side container. Classes applied right side fixed container. Classes applied in unfixed table when fixing direction is left. Classes applied in unfixed table when fixing direction is right.